Display Boat & Airplane Models. Rod Machado's Books & Tapes. 52mm AO Original Pilot Sunglasses. 55mm AO Original Pilot Sunglasses. 57mm AO Original Pilot Sunglasses. Sometimes it is difficult to decide which is the correct sunglasses size for you. Generally speaking, a normal sized man will choose the 55mm or medium size. Larger men and men with more round heads wil usually find the 57mm-58mm or Large size fits best. Small men and women will generally need the 52mm size. 49mm Size = 4.66" Wide Frame 51mm Size = 4.70" Wide Frame 52mm Size = 5.00" Wide Frame 55mm Size = 5.25" Wide Frame 57mm Size = 5.50" Wide Frame 58mm Size = 5.75" Wide Frame 61mm Size = 6.00 Wide Frame. The New 2018 Randolph Engineering Aviator Sunglasses Flash Mirror All Versions. The Extraordinary Enhanced Randolph Engineering Aviator Sunglasses for 2018 are here! These aviator sunglasses are the real deal! Built to the precise Mil-S-25948 military standards, these Aviators have been standard issue to U. 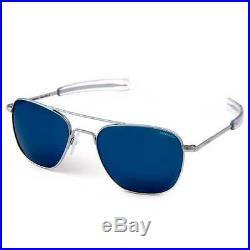 In fact, these Aviators are standard issue to many foreign military pilots around the world as well. Made in the USA since 1973, these Aviator sunglasses have been the top choice for all pilots around the world. This is because they are battle tested in the most demanding situations and have uncompromising quality and durability. These updated Aviators take 6 weeks and 200+ separate operations to construct. The 23k Gold plating and other fine finishes are applied at up to 5 times the industry standard and are designed to last a lifetime. Choose between the unique bayonet or skull temples for the best fit. Your SkyTec mineral glass lenses have been enhanced with new coatings, an upgraded edge finish and optical quality backside AR (Anti-Reflective) coating. You will be delighted with the incredible optical lens quality and visual acuity. With 100% UVA & UVB blocking your eyes are always protected from harmful UV radiation. A new locking compound has been added to the screws to prevent backout. New plating and finishing improvements with new inspection processes improve product quality and consistency. Your sunglasses will come in the new packaging which includes. 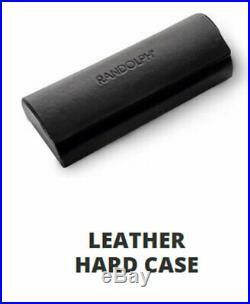 A genuine leather hard case with magnetic closure. 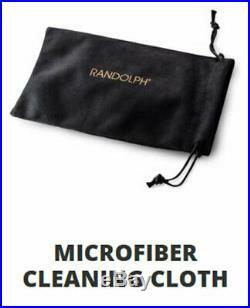 A microfiber pouch that doubles as a cleaning cloth. And a beautifully designed exterior box. I have worn these sunglasses myself since they first came out and they are as beautiful and work just as well as the day I got them. Our eFulfillment centers are open Monday through Friday and closed weekends and holidays. We welcome your questions and will try to answer them as quickly as possible. Please provide as much information as possible so that we can provide the very best answer possible. We are satisfied only if you - our Customer - is satisfied! Sign up for our store newsletter and be the first to hear about new items and special limited-time discounts! The item "The New 2018 Randolph Engineering Aviator Sunglasses Flash Mirror All Versions" is in sale since Wednesday, November 9, 2016. This item is in the category "Clothing, Shoes & Accessories\Men's Accessories\Sunglasses & Sunglasses Accessories\Sunglasses". The seller is "jetaviator7" and is located in Randolph, Massachusetts. This item can be shipped to United States, Canada, United Kingdom, Denmark, Romania, Slovakia, Bulgaria, Czech republic, Finland, Hungary, Latvia, Lithuania, Malta, Estonia, Australia, Greece, Portugal, Cyprus, Slovenia, Japan, China, Sweden, South Korea, Indonesia, Taiwan, South africa, Thailand, Belgium, France, Hong Kong, Ireland, Netherlands, Poland, Spain, Italy, Germany, Austria, Bahamas, Israel, Mexico, New Zealand, Philippines, Singapore, Switzerland, Norway, Saudi arabia, Ukraine, United arab emirates, Qatar, Kuwait, Bahrain, Croatia, Malaysia, Brazil, Chile, Colombia, Costa rica, Panama, Trinidad and tobago, Guatemala, Honduras, Jamaica, Antigua and barbuda, Aruba, Belize, Dominica, Grenada, Saint kitts and nevis, Saint lucia, Montserrat, Turks and caicos islands, Barbados, Bangladesh, Bermuda, Brunei darussalam, Bolivia, Ecuador, Egypt, French guiana, Guernsey, Gibraltar, Guadeloupe, Iceland, Jersey, Jordan, Cambodia, Cayman islands, Liechtenstein, Sri lanka, Luxembourg, Monaco, Macao, Martinique, Maldives, Nicaragua, Oman, Peru, Pakistan, Paraguay, Reunion, Viet nam, Uruguay.